(17/P61) TRENTON – Contractors for the Department of Environmental Protection this week are launching a project to cap and contain pollution from a 1970s-era landfill in Kearny in the middle of a major metropolitan rail and highway hub along the Passaic River. The $39.4 million project involves construction of a containment wall surrounding the 94-acre landfill and placement of a cap consisting of an impermeable synthetic liner and clean soil. Systems to treat contaminated ground water and landfill gas also will be constructed. The finished cap will be planted with vegetation beneficial to wildlife and erosion control. The Municipal Sanitary Landfill Authority 1D Landfill sits in the middle of one of the busiest convergences of transit and transportation systems in the state and region. It is bounded to the east by the eastern and western spurs of the New Jersey Turnpike as they divide south of exit 15, to the north by the I-280 connector to the Turnpike, and to the south by NJ Transit and Amtrak rail lines that run along the Passaic River. Kearny leased the land to the Municipal Sanitary Landfill Authority (MSLA). The landfill accepted municipal and industrial wastes from the early 1970s until its ceased operations in 1982. Approximately 1.5 million gallons of waste oil were deposited at the landfill as well as waste from pharmaceutical manufacturing, sewage sludges, asphalt sludges and insecticides. To this day, contaminated leachate flows from the landfill into the river through the ground water that migrates under the rail lines as wells through wetlands, which is ground water that has become contaminated after percolating through a contaminated site. In 1999, the DEP began work to investigate the nature and extent of contamination at the landfill with the goal of properly remediating the site. Investigations at the site determined the presence of polyaromatic hydrocarbons, pesticides, metals, volatile and inorganic chemicals in the ground water, soil, surface water, sediment and leachate. After the investigation, several steps were taken to prepare the site for proper closure but the project never moved forward. Efforts by the state over the years to identify viable responsible parties to pay for the work have been unsuccessful, but are ongoing. The DEP has earmarked money from its publicly funded cleanup program to proceed with the project as part of an overall effort to improve water quality in the Passaic River, one of the nation’s most polluted waterways. Sediments in this stretch of the river are contaminated from past discharges of highly toxic dioxins and other contaminants from a plant just upriver in Newark that manufactured the Vietnam War-era defoliant Agent Orange. This stretch of river is now the focus of a multi-billion-dollar federal Environmental Protection Agency remediation project supported by the DEP. The construction of the cap-and-wall system for the MSLA Landfill will cut off the flow of leachate from entering the river. 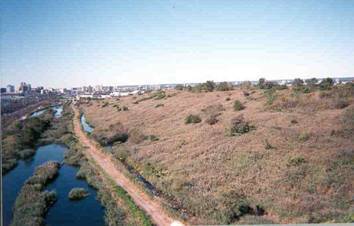 The Passaic River connects with the Hackensack River at Newark Bay, just over a mile from the site. Up to 83,000 gallons of leachate each day will be collected and sent to the Passaic Valley Sewerage Authority’s plant for treatment. Landfill gases that now discharge to the air will be captured by a gas flaring system that will reduce greenhouse-gas emissions. The landfill ranges in elevation from just five feet above sea level to a maximum elevation of 110 feet above sea level and will be regraded to reduce erosion. DEP ordered the landfill to cease operations in 1982 because it reached its maximum allowable height and due to the MSLA’s failure to manage leachate. A soil cover was placed over the landfill at the time of its closure but the site was never properly capped or maintained and did not prevent the infiltration of precipitation into the landfill, which exacerbates the leachate problem. Trees and other plants subsequently grew in this soil cover. The primary construction contractor is Old Bridge-based A. Servidone Inc./B. Anthony Construction Corp./Barbella Construction Services. Construction engineering and remedial design are being conducted by the Louis Berger Group of Morristown. At the completion of the project, the site will be planted with wildflowers, grasses and other plants to provide habitat for songbirds and other wildlife.